Note that the graphic, not the text, was updated with new findings on 8 August 2016. Newly-discovered Y-SNPs aren't hatched along with names. Until a name is assigned, a SNP is designated by its position on the Y chromosome followed by its common value (as found in prior testers) and its mutated value, like this: 13135677 G T. The first letter is often referred to as the "reference" or "ancestral" SNP, and the second as the "derived" SNP value, the one the tester has. In other words, at position 13135677 on the Y chromosome, instead of a G, the tester has a T. It's sometimes designated like this, which is what I'll use below: G13135677T. We now have two Big Y test results for CF07, kits #140728 and #358156. Their most recent common ancestor (MRCA) was John A Cooley (1756-1794) of Darlington County, SC who is believed to have been a son of John C Cooley (c1725-1767) of Halifax County, NC. The test results show that John of Darlington would have been born with eleven SNPs that were previously unknown. Now that they have matches (between the two testers), names will be assigned to them. The new SNPs and their relative placement on the world-wide SNP tree are in the green boxes below. The tree starts with the 4500 year-old SNP, DF21. (and thousands more) found above his name. How do we know the placements of these three boxes? The SNPs in the larger box were shared by both lines. These men would have gotten them only from John Cooley, meaning he was born with those specific DNA molecules in his cells. The single SNP for kit #358156 is the only one he doesn't share with the William descendant. Therefore, it had to have emerged somewhere in the lineage from Kinchen's birth to the tester. Likewise for the six SNPs in the other lineage. The difference in numbers is consistent with the Big Y test results in my own group, CF01. I have five SNPs that would have come into play beginning with the birth of Edward Cooley (1763-1822), a son of John Cooley (c1738-1811) of Stokes County, NC. 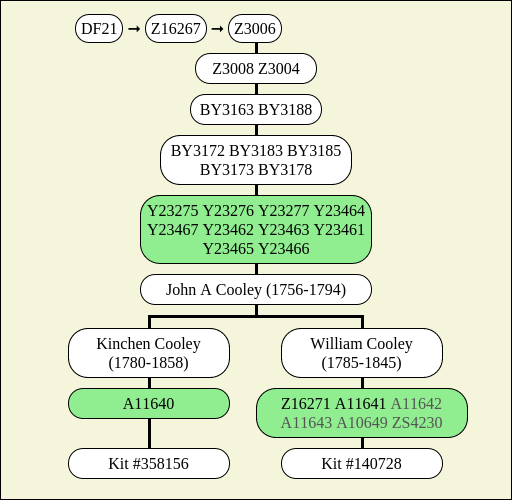 The other tester has two SNPs that entered his Cooley lineage from the birth of Edward's brother, James Cooley (1772-1821). Why blocks? We simply don't yet know how the individual SNPs will be placed on the tree in respect to one another. New branches need first be discovered from the results of new testers, just as these two testers have added significantly to our knowledge of SNP identity. I illustrate how large blocks of SNPs can be broken down from a small number of additional tests in the article Y-SNP Discovery, Part II. And then there's the obvious question of genealogy. I believe the records for the Darlington Cooley family are sufficient to prove the lineages but if there's any doubt, this test should settle it. Some genealogists believe that John A Cooley was the son of Peter Cooley and Hannah Couch, Peter being a son of Samuell Coley (c1615-1684) of Massachusetts. Three testers claim descent from Samuell but all three have differing Y fingerprints and are yet different from #358156 which, I suppose, would make for a fourth competing Y-print. At least one well-documented descendant of Samuell's will need to step forward before that matter can be settled. In any event, the connection between these Cooleys and Peter looks unrealistic. This article represents my own cursory findings over the last several hours. Some of the new SNPs may prove extraneous through additional analysis. Indeed, I reduced the large block from FTDNA's listing of 27 SNPs simply due to the fact that the other 16 were not really SNPs! It's possible that additional errant SNPs will be found. Bona fide SNP names will be created from the analysis team (they who have the proper software) that is first to complete its investigation. These days, FTDNA has a huge backlog and is very slow.